Vacation rental cabin / bungalow. Sleeps 16, 5 bedrooms, 3.5 bathrooms. No pets allowed. 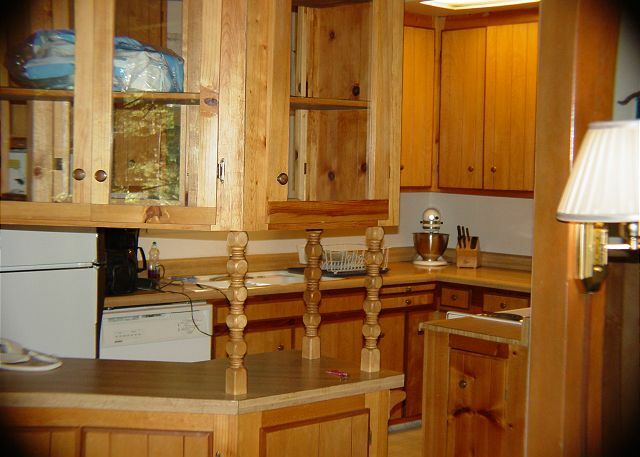 2500 square feet of mountain luxury; large front deck; level access. Lots of room to spread out. Only minutes to Pinecrest Lake. Quiet, secluded area. Easy access to Hwy. 108. You won't want to leave! (Cleaning Fee: $150) NOTE: No wifi service at this elevation and cell phone service may or may not work, depending on your provider. Cabin Layout: Tri-Level. 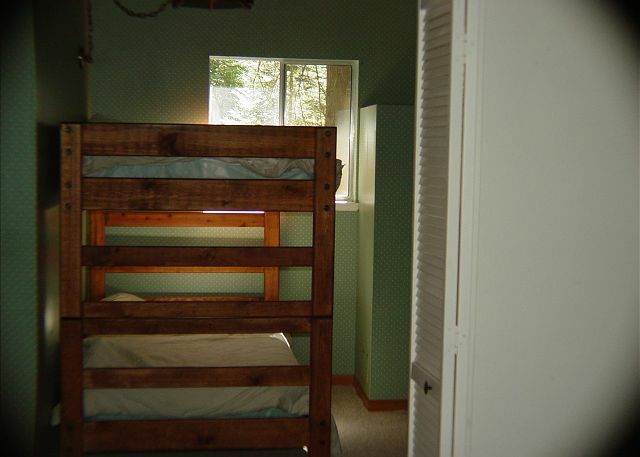 Main Floor: Living/Dining/Kitchen; Family Room; 1 Full BA; 1 BR w/Bunks + Trundle. The cabin was a great place for our family to stay. It's older and has been well loved, but has lot of space for people to sleep and hangout. Outdoors were great with a large deck and yard. Great for larger groups. Very nice cabin for a large group. The master bedroom and the 2 king bedrooms upstairs are very nice size. The upstairs Queen bedroom, however, was shockingly small - the bed was shoved into a corner so the inside person had to crawl over the outside person in order to exit the bed. That was our only complaint, however. Everything else was very nice. 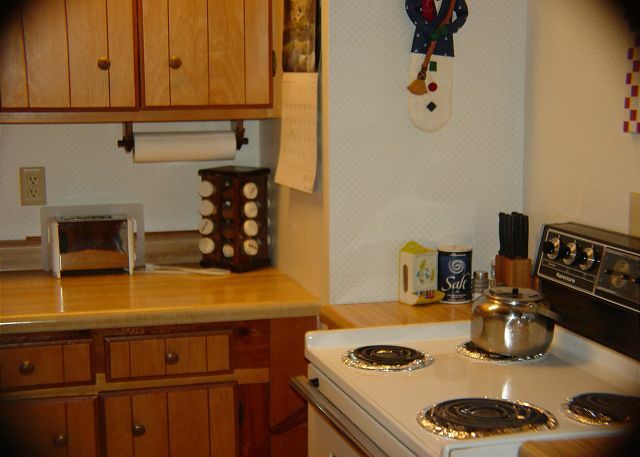 The kitchen could use some serving dishes and platters. Other than that, it was well stocked. The area is very nice and quiet and close to the lake. We enjoyed our stay there. Another GREAT July 4th in Pinecrest! 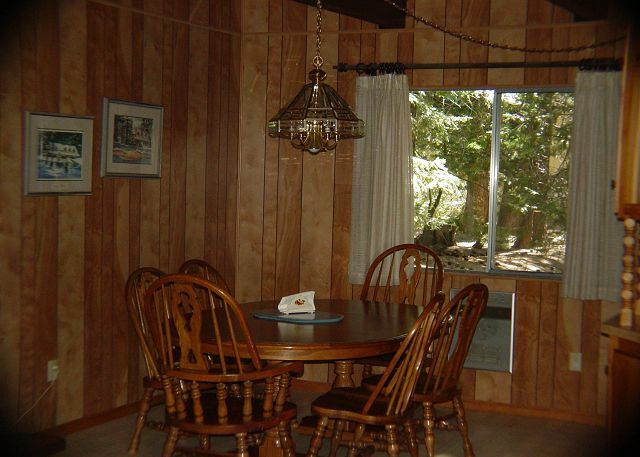 This cabin had everything my group of 15 wanted: very roomy, outdoor seating and deck, minutes from Pinecrest lake! The cabin is very roomy. It's a nice area. Clean. The cabin is 7 minutes away from the lake. Outside padio is very nice to hangout. Our stay at this location was great. Our family had a great time! We had a large group so the accommodations worked out extremely well. Everything was great. The cabin was clean and welcoming; different layout but lots of room. Our family reunion was very enjoyable. Pinecrest Lake was super close by. Quiet; lots of parking space. Wonderful cabin with plenty of character in a breathtaking setting! Management rep was very nice and prompt with communications. My one tiny complaint ... would have liked the outdoor seating area to have been swept and tables wiped down. At the beginning of your vacation you don't want to have to do that type of housework :). Thanks for the trip. 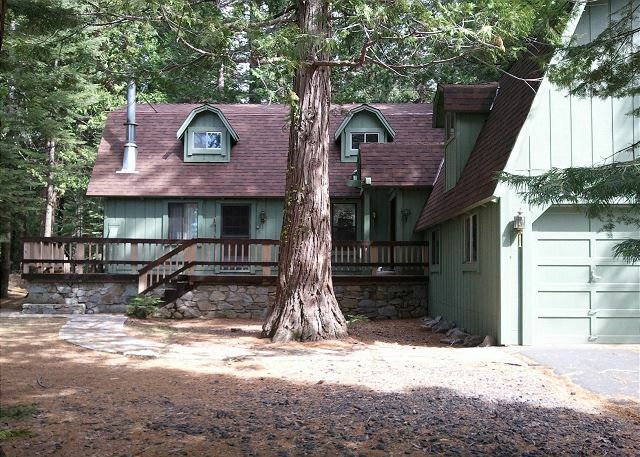 We enjoyed the house and the location to Lake Pinecrest was convenient. 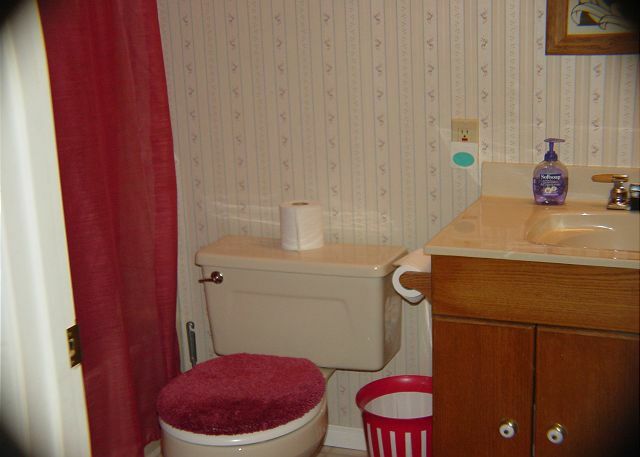 This is a great property, plenty of room. We enjoyed are time and plan on making this a yearly vaction. 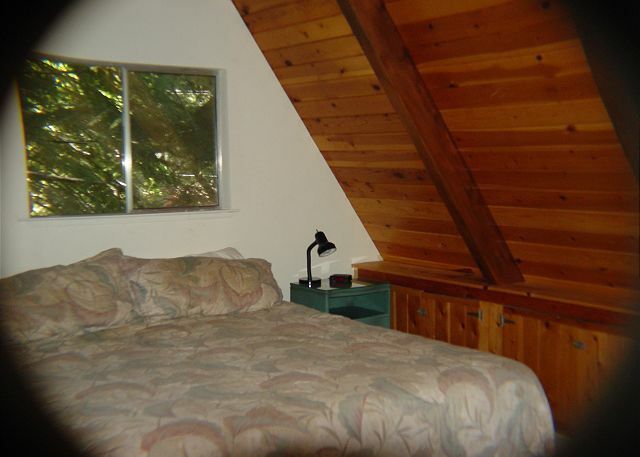 Twain Harte Vacation Rentals cabin #59 is truly a home-away-from home. It's comfortable, attractive and well-stocked. With the layout of the two floor levels and separate wings and the 3 1/3 bathrooms we had a lot of privacy. I'm afraid we called Margie at the front office a few too many times with various problems we had, one time because we ran too many bathroom appliances at once and thought we'd thrown a breaker (we didn't know to press the red button on the light switch to restore power), but she was always helpful and kind to us. We've been told the cabin will be sprayed for carpenter ants--which was our only real complaint. Their pepper-like dust would get on floors and ledges and make the place look dirty. If we ever go back again that problem should be resolved, and we would surely like to go back! One night we had 14 of our relatives over for a barbecue, and, with the tables outside, that crowd fit beautifully into the space of our rental property. We felt sad when our last day came and we had to lock the front door and leave. My family of 12 stayed here, and we had room to spare. It's very roomy and comfortable. They even had a small table and small chairs for the little ones, which was nice. However, there is no cable or satellite service, just a DVD player, so luckily my daughter had some DVD's in her car. It's not too far from Pinecrest Lake, but not walking distance for sure. We enjoyed our stay here, and most likely will stay here again! Had a great time. Only suggestion is that the dryer takes 3 to 4 hours to dry towels and there is a moldy smell in the garage and hall that should be investigated by the owner. TV's dont work at all either. 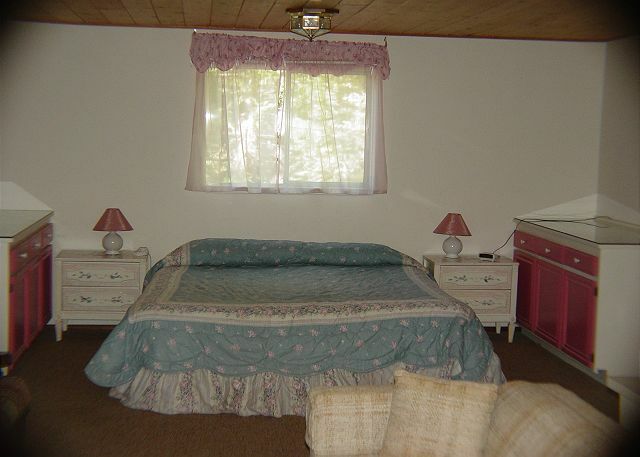 Otherwise it is what you would expect from an older cabin. Location is great and sleeps as many as advertised comfortably. the cabin was perfect for a family of 15.
plenty of room for the kids to play both in and ourtside. close to pinecrest lake. only problem was it went too fast! Thank you! This is the second time I have used this cabin for a girls retreat. Its clean , we all fit comfortably and close to the lake. As my six year old granddaughter said," Grandma, this is the most beautiful house I've ever seen!" She was so excited as we had been planning this vacation for almost a year. 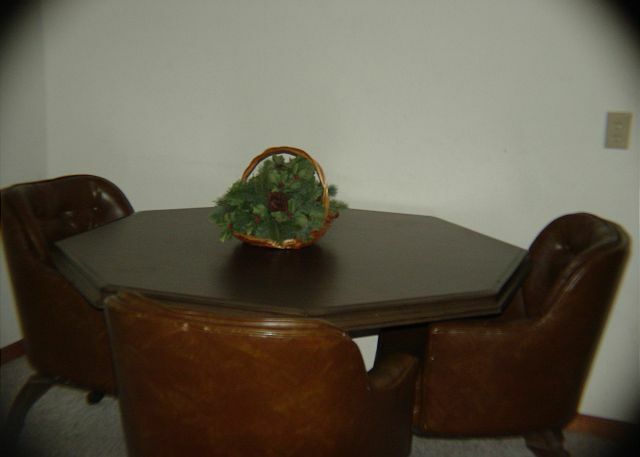 The family all agreed that we had a great time and we can highly recommend this property. The home was very comfortable. We enjoyed our stay. Thank you very much we are very enjoyable for the last weekend.The kitchen just a little too small for the group of 14 people. The cabin was a perfect size for our group, it could have been cleaner. Did not feel comfortable putting food in cabinets or leaving out on counters. Margie from THVR responded immediately when we reported problems. This house was perfect for our extended family (oldest guest was 88, youngest was 2 1/2 months). 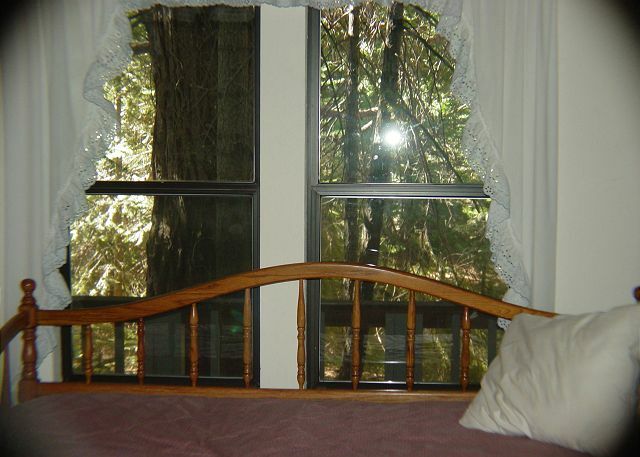 Nice quiet location, but close to Pinecrest Lake. Enjoyed kayaking, fishing, hiking, and just being together in the pines. Great location, conditions were not very clear and the cleaning service had just left. We had a lovely stay. The place was clean, had plenty of room and all ameneties were there. It was near enough to Pinecrest lake that some of our more athletic crew ran there in 1/2 hour. Strawberry is also nearby. Beautiful place.